Hickory Street Annex is an eclectic, industrial, historic brick and concrete warehouse that hosts weddings, receptions and other special events. This gorgeous February wedding reception was shot by the talented Lindsey Davenport. The couple wed at Perkins Chapel and returned to Hickory Street Annex for an excited reception including dinner from Vestals Catering, a traditional bridal cake from Panini Bakery, an eccentric grooms LSU cake from Fancy Cakes by Lauren, and dancing by the famous Jordan Kahn Orchestra. Beautiful winter blooms by Billie Ball & Co decorated the entire bridal party, entry way, and guest tables. 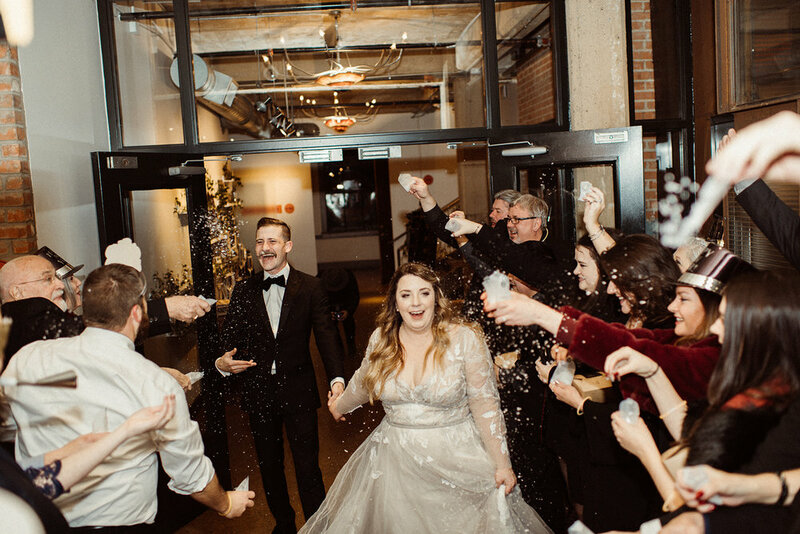 Annie and Joseph celebrated their marriage with a gorgeous reception at Hickory Street Annex in January 2019. The special day planned by the bride and her mother went off without a hitch starting with the ladies being pampered and getting dolled up before leaving for the ceremony held at St. Thomas Catholic Church in Dallas, Texas. Friends and family the returned to begin their reception with cocktails and dinner from Vestal’s Catering. Tables were simply decorated by our favorite florist, Billie Ball & Co, as guests enjoyed their meals. Signature Band kicked off the dance party as guests finished off some delicious dessert from Jenny Layne Bakery. The beautiful occasion captured by the talented Wilderlove Co Photographer, Rebecca Crenshaw. What’s a better way to ring in the new year than marry your best friend! Bri and Beau wed at Hickory Street Annex on the last day of the year with their family and friends. The day was beautifully crafted by House of Tales coordinator, Maya Jareou, and perfectly embodied the bride’s gorgeous style into the day. Gro Designs created the gorgeous altar for their vows and a dripping greenery look above the head table. Rentals from Posh Couture Rentals and La Tavola Linens decorated the tables with service and dinner from Vestal’s Catering, bar facades by Bella Acento, and the couple’s settee by Coral Lane Rentals. Three beautiful cakes designed by Fancy Cakes by Lauren decorated the Annex’s trestle table along side sweet treats from Vestal’s pastry chef. A fan favorite DJ, Adam Morgan, from LeForce Entertainment kept the party going to ring in the new year. The photography captured by the aptly named The Moody Romantic. 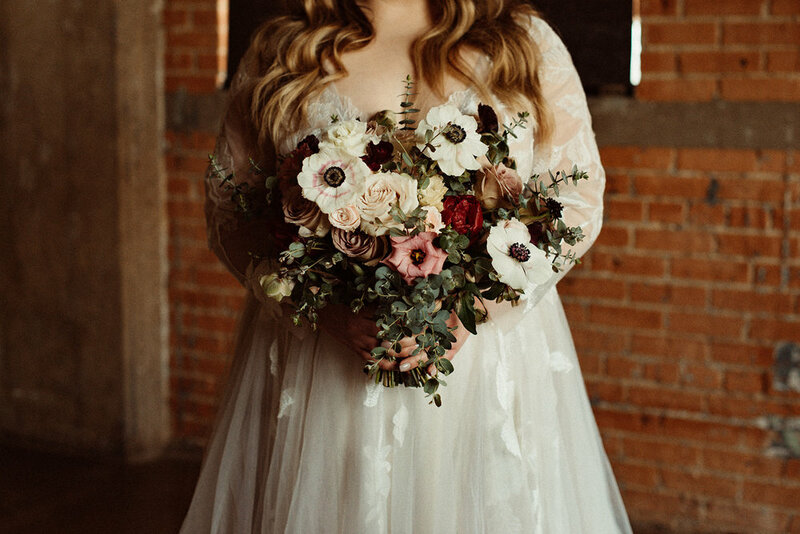 These stunning photos by Shannon Skloss topped off a successful fall wedding season for us here at Hickory Street Annex. Bold burgundy, coral, and copper florals by Billie Ball & Co accented with touches of navy created the perfect blend of rustic and industrial. The couple opted for cross back chairs rented through Party Rent DFW to tie the look together. After a sweet ceremony, guests enjoyed a lovely dinner catered by Gil’s Elegant Catering with an almost too pretty to eat cake by Crumb and Kettle and pies by Little Pie Kitchen. The night capped off with live music from In10city Band before sending off the newlyweds as Mr. and Mrs.
Erin and Parker’s wedding day was a sophisticated dream. White, navy, and green florals by Max Owens Design filled the room in coordination with the tables cape and wedding planning by After Yes featuring Posh Couture Rentals plate ware, glassware, and flatware. The bride’s gown from Stardust Celebrations was complimented with hair and makeup by Erin Blair team. Gil’s Elegant Catering brought their A-game with a delicious and special Asian plated dinner before guests enjoyed dancing from LeForce DJ, Adam Morgan. An almost too pretty to eat four tiered cake from Layered Bakeshop topped off the night before guests sent the newlyweds off in their Blue Diamond Limousine rental. Videography by the extremely talented Henry Weddings and the gorgeous photos that we share from Stephanie Brazzle. 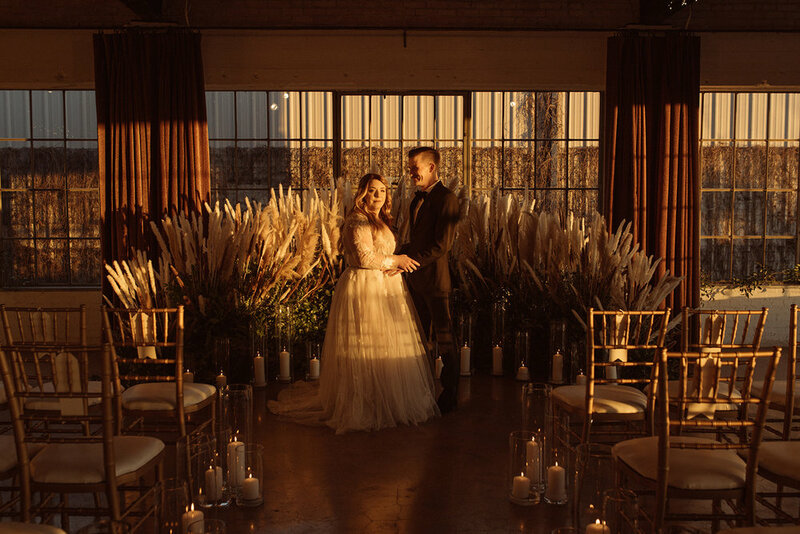 We are so in love with Loveleen and Michael’s wedding photos from their reception at Hickory Street Annex shared by their photographer, Amy Karp. In traditional wedding style, the bride chose beautiful white and blush florals with touches of greenery from Billie Ball & Co, not to overshadow her amazing navy and blush sari. Day-of coordination by Karli Spangler of Ivory and Vine Event Co handled the final details and communication with their vendor team. A traditional Indian dinner served by CoHost followed by three tasty cakes by Tart Bakery. Dancing followed, including a choreographed bridal party dance, by DJ Riz Entertainment. Kevin and Karoline’s dream wedding was a boho dream captured by Lauren Apel Photography. Coordination by Maxwell + Gray Studio worked together with the all star vendor team to pull the look together perfectly. The amazing floral and decor by Billie Ball & Co used primarily potted plants that the couple were able to take home and replant in their garden to always remember their special day. Julia McNally performed her live art during the ceremony to commemorate the occasion as well. Guests enjoyed dinner by Vestal’s Catering along with a special after dinner treat of Mudleaf Coffee Bar and a gorgeous (and delicious) cake from Crumb and Kettle. If guest’s weren’t dancing from the music brought by LeForce Entertainment DJ, Dominic Nagella, they were outside enjoying the Happy Photo Bus making their own memories to take home. Sarah and Ian tied the knot at Hickory Street Annex in early October while braving the rain for some gorgeous photos taken by Epic Productions. The altar featured Billie Ball & Co’s chicken wire frames to bring a lush and bold focal point for the couple to say ‘I do.’ They kept the ceremony and reception intimate with a dinner served by Gil’s Elegant Catering. Cake by Frosted Art Bakery followed up with a champagne tower toast before guests resumed dancing the night away from Big J All Day, Jason Abbott. Dreaming of an ivory, blush, and mauve wedding? Look no further to the chic floral from Roy and Fabiola’s special day captured by the talented Amy Karp. Design and decor by our favorite florist, Katie Arani, owner of Billie Ball & Co, Brought the couples romantic vision alive. Ceremony was held at the Place at Tyler before guests arrived to Hickory Street Annex for the reception. Coordination by After Yes made the transition for this change of scenery silky smooth. Dinner was served by the amazing Gil’s Elegant Catering along with the beautiful cakes by Sweets by Selina. The night followed with dancing from Gala Sound and Lighting before the couple jetted off as Mr. and Mrs.